Are you currently in the market for a home camera surveillance system? Do you know where to start? If not, the following article may prove very useful. Here we have compiled a type of home camera surveillance system buying guide, in which we have highlighted the various characteristics of these systems and pointed out several factors you should consider before making a purchasing decision. What Is a Home Camera Surveillance System? What Type of Home Camera Surveillance System Do I Need? Can I Store My Video? Camera Features: Dynamic vs. Static, Zoom, Etc. If you watch real police dramas (Cops, Forensic Files, etc.) or professionally acted television cop shows (NYPD Blue, Chicago, PD, etc. ), you have no doubt seen footage from a home (or business) camera surveillance system. These cameras can monitor people and objects both inside and outside of your home, and are designed to help keep you, your family and your possessions safe from prowlers and thieves. Home camera surveillance systems can offer a lot of things to a lot of people, such as safety, security, and another “set of eyes,’ but their most important function is the peace of mind they offer to those who own them. Surveillance of your home can and should be an important component of your total physical protection plan, helping to watch over your home when you are not present or are otherwise busy sleeping or in another part of the house. Home camera surveillance systems have been around for several decades now. If you have ever watched any old footage from these systems, say back in the 1980s and 1990s, you know that the images could be quite grainy and hard to see. Sure, one could tell if “someone” was outside their home with one of these camera systems, but determining just who that person was could be a problem back then. Fast forward 30-40 years and you have the home camera surveillance systems of today—systems that have greatly evolved with the enormous leaps and improvements in camera and video technology. Today there is a massive range of surveillance products available for purchase. These products, while ranging in price, also vary greatly in terms of complexity, capability and the number accessories that make them even more useful. To help you sort out the different products and accessories available today, the following buying guide will cover some of the most frequently asked questions about home surveillance systems—providing answers to almost everything you could want to know about these systems before making a final purchase. When determining the exact type of home camera surveillance system you need, the first questions you will want to ask yourself is “what am I aiming to protect” “how many cameras do I need,” and “are the cameras going to be outside or inside?” Once you have answered those questions, simply consult our list below—a list that describes the various types of cameras and how and where they are typically utilized. Before we discuss the various types of cameras for home surveillance, let us first describe the most basic home camera security devices: baby monitors and nanny cams. Both of these camera systems allow you to keep your eyes and ears on a subject. Baby monitors can help you check on a sleeping baby without actually entering the room and potentially waking him or her from their slumber. Some come with audio as well, which can help you hear the baby when he or she wakes up. Nanny cams are very similar to baby monitors, but in most cases the owners of these systems tend to hide the camera out of sight, allowing them to keep tabs on their child and their caretaker while at work or somewhere else. Many parents have invested in nanny cams in the last decade, especially when footage began to surface that showed some nannies and babysitters mistreating the children in their care. The great thing about both the baby monitors and nanny cams of today is there built-in Wi-Fi capability, which allows the cameras to be paired with a wide range of mobile devices, such as laptops, tablets, PCs and smart phones. Some nanny cams and baby monitors even have motion-detection capability, so the camera only turns on when someone enters the room or when someone in the room begins to stir. Beyond nanny cams and baby monitors there is a whole range of handy, professional-style cameras that serve as the primary instrument for home security and surveillance systems. These cameras assist homeowners by helping them keep an eye on the activity both outside and inside their home. They come in different styles and shapes which allows them to serve different purposes around the home, and their prices range based on factors such as resolution, size, clarity, sound quality (if any), etc. One of the first types of cameras ever to be introduced, the bullet camera has been around for decades. Bullet cameras are the familiar-looking cylindrical cameras you are likely to see everywhere. Although always shaped as a cylinder, these cameras can vary in size (some are as small as a tube of lipstick), but most of the time they are about the size of a soda can or slightly larger. In homes, bullet cameras are used primarily on the outside of the house, and in businesses they are used both inside and outside. Bullet cameras, which are usually mounted high on a wall and considered very durable, are great if you know the exact area in which you want the camera to cover—such as a porch or a driveway. If you have ever been to a casino, you have no doubt seen dome-style cameras hard at work—also known as the “eye in the sky.” Unlike bullet cameras, which are usually mounted on a wall, dome cameras are typically mounted on the ceiling. Like bullet cameras, they are wonderful for keeping an eye on a certain area, and they are not as conspicuous looking as the bullet camera. Dome cameras are usually mounted inside a home to keep an eye on a certain area, but they can be remotely panned, tilted, and zoomed by the user. Many parents install a dome camera in their entryway, as it allows them to see when their children return from school or an activity. They can also be used near sliding glass doors, or hung over areas in which valuables are usually stored. Those who want the finest in live viewing often opt for live streaming cameras. Live streaming cameras are ideal for remote, unmanned monitoring and some can even pan, tilt, scan and zoom via remote control. Although these cameras can be mounted on a wall, in most cases they are merely placed on a piece of furniture in plain view. These cameras are designed specifically to feed a signal directly to a computer, laptop, tablet, smart phone or other mobile device for live, uninterrupted viewing. If you truly want to catch someone in the act—especially someone who is up to no good—than a hidden camera is the way to go. Hidden cameras come in a variety of shapes and sizes. They are typically disguised as something other than a camera, or they are so small they can fit in areas where nobody would dare to look. There are hidden cameras that can be placed in flower pots, disguised as pens or photographs, and even “teddy bear” cameras—a stuffed animal with a built-in wireless camera. Like live-streaming cameras, hidden cameras can feed a signal to a computer or any other type of mobile device with Wi-Fi capability for live or taped viewing. Wireless cameras are very popular these days. In fact, they are the choice for most of today’s home security systems. Wireless cameras are plug and play devices that are easily integrated into existing home surveillance systems and into home automation schemes. With names like the Nest Cam, Arlo and Samsung’s Smart Things, these cameras have been flying off the shelves these days for their ease of use and simple setup. Once you have decided on the type(s) of camera you need, there are still many more things to consider. Today, cameras come with a variety of different options and specs from which to choose, some of which may or may not be necessary for your particular needs—or budget. However, once you have educated yourself on the different options, you’ll be able to make a more informed decision about the exact type of camera and system you need. Resolution is a word heard frequently in the camera discussion, but what exactly does the term mean? Basically, resolution defines the “amount of visual information that a security camera is able to capture.” Resolution is usually measured with a number; the higher the number, the more visual information the camera will be able to capture, which results in better clarity of the video or picture. Higher resolution also gives you the ability to zoom in on specific images of your video feed without blurring the image—an important factor for those looking to identify certain intruders. Analog security cameras send out a basic video signal, much like that of the older non-flat screen televisions, to a Digital Video Recorder, or DVR (used to be a VCR), which processes the video into a digital format for viewing. In terms of resolution, analog security cameras range from 420 resolution to 700 resolution to the newest 960H resolution. Naturally, the camera with 700 lines of resolution will produce sharper and clearer images than the 420 camera, and the 960H resolution security camera is the sharpest video of them all. Which analog camera you buy depends on your needs, but keep in mind that the price will be higher for higher resolution cameras. Digital security cameras process and condense the video signal into a digital format at the camera itself (instead of at the DVR like the analog cameras). The cameras then send the digital signal through an Ethernet or Cat-5 cable to a Network Video Recorder or NVR. Each camera you connect to an IP camera system is essentially like a little computer that you can connect to access your video feed, and all the video processing is done at the camera. Because the feed from a digital security camera is already in digital format it isn’t subject to any analog broadcast standards. What this means, at least in theory, is that the sky is the limit when it comes to resolution. Your only limit is how much data you can store, because higher resolution video feeds require much more space to store all of that information. In the case of digital cameras, you may find you are able to capture more area with fewer cameras, and at a greater distance than with standard analog cameras. If you require greater detail at a distance, you probably should opt for an IP camera setup. Should you choose a home camera surveillance system with a black and white video signal or a color feed? Actually, it depends. In 2018, it may sound strange that we are even talking about “black and white” video, but choosing between that and color is an important decision that may greatly affect the price of your overall purchase. In certain situations, cameras that transmit a black and white video signal may be all you need to get the job done. For instance, if you are merely trying to protect your home from intruders, you can still see someone near your home with a black and white feed. And during the nighttime hours, a color camera may actually be inferior to its black and white counterpart, as the latter can often produce greater nighttime resolution for a much lower price. That being said, it’s important to know that in some cases, color images can be priceless. The ability to give the authorities an accurate description of a would-be thief—his clothing, etc.—or the ability to properly identify the car that rear-ended you, can vastly help with the pursuit. Color cameras work best in well-lit areas and are often the first choice for indoor use. Choosing between a continuous-running camera and one that is self-activated when it detects movement depends largely on how you plan to use it. If your desire is to monitor a babysitter or housekeeper, for example, you may want to turn your camera on for their entire stay so you can monitor their every move. However, if you prefer not to have a camera running non-stop, you can always invest a bit more for a motion detector camera, which springs to live when it detects the slightest form of movement. Of course, motion detector cameras will also pick up “some” unnecessary video (depending on their sensitivity), but it’s better to be safe than sorry. Also some motion detector cameras have what is called a memory buffer, which allows it to go back and record between 5 and 15 seconds of action before the original motion was detected. If your primary concern is to pick up outdoor images and activity in the dark, you may want to select a home camera surveillance system with low-light imaging technology. Certain cameras available today are equipped with very sensitive light-gathering image sensors. This “sensitivity” is usually expressed by a number in lumens—the smaller the number, the more efficient the camera will be in low light areas. There are also cameras that are equipped with infrared technology, which allows them to pick up images in total darkness, but these can be very expensive. Finally, if low-lighting is a problem outside your home—such as on your driveway—you may want to check out some of the motion detector cameras that are also equipped with a light. When the unit detects movement, both the light and camera click on to capture it. Memory Cards. Some cameras, like the IP cameras we mentioned earlier, are equipped with their own memory cards for storing digital data. This is a very affordable option upfront, but owners will still need to swap these cards out every so often or run the risk of recording over other video. Hard Drives. For cameras that transmit to computers and other mobile devices, the video from that camera can be stored directly on those devices’ hard drives. They can also be stored on the hard drives that come with their security system—typically an external hard drive. DVRs, which compress analog video in digital pictures, also have a hard drive on which video can be stored. Cloud. Perhaps the most affordable way to store video these days is on the cloud. Today, the emerging standard of subscription-based cloud storage is offered with some security system package deals. Off-site storage can provide up to two terabytes of encrypted storage in exchange for a recurring fee. If you plan to mount your home camera surveillance system on an outdoor surface that is not protected overhead by any structures, you will definitely need to ask for a weather or water-proof camera that can stand up to the demands. Most of these cameras are mounted on walls and are of the bullet or cylindrical variety. Outdoor cameras such as these typically have an IP rating (not to be confused with Internet Protocol cameras) that indicates how they hold up to weather. The first number will indicate how the camera stands up to solids—as in someone trying to intentionally break it—and the second number has to do with liquids—like snow, rain, etc. The higher the number, the more resistant the camera. The cameras used in home surveillance systems today come with a lot of bells and whistles. If choosing a camera for outside, especially a camera that will watch over a large area, you may want to select a dynamic camera rather than a static camera. Dynamic cameras will automatically pan (move back and forth) and tilt to cover a large area. These cameras are great at picking out important details in a crowded scene. However, for porch or entryway cameras, a static camera will usually do just fine. Some cameras, known as PTZ cameras also have a zoom, pan and tilt function, which allows you to close in on the subject without losing much clarity, move the camera up and down, and from side to side. These can be helpful both indoors and outdoors. Certain cameras today are also equipped with an image stabilization feature, which allows the operator to stabilize videos of people in action to get a clearer view of the details. Think the babysitter may be mistreating your child? If so, you will definitely want a home camera surveillance system that allows you to hear as well as see what is going on. As camera surveillance technology has become more and more sophisticated of late, there are now many systems that feature a range of integrated audio features. Some integrated audio cameras also allow you to speak through a speaker that is attached to the camera. Doorbell cameras with this feature are great for scaring off potential intruders—or sales people—and entryway cameras such as this allows you to welcome your children home from school no matter where you happen to be. 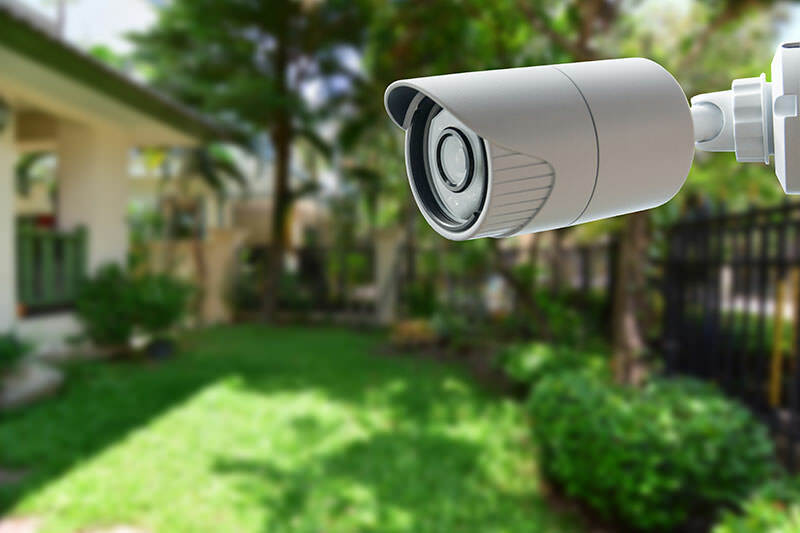 Audio camera systems make sense in a lot of situations, but if you are merely watching a large outdoor area, you may not need to spend the extra money required to upgrade to audio surveillance. As you can see, the process of purchasing a home camera surveillance system will require you to consider a wide variety of options and scenarios. For instance, if you plan to set up a comprehensive system that will help guard the outdoor and indoor portions of your home, you will first need to consider the types and number of cameras you will need for complete coverage. Once you have made that determination, you can choose from the many camera options that are currently available, some offering the very latest in intelligent and innovative technology. Depending on the complexity of your home camera surveillance system, you can choose a self-setup or professional installation (recommended for very sophisticated systems). Keep in mind that there are different laws around the country with regard to security cameras and privacy, so be sure to know the specific laws in your state before putting in the work to install your system.